This is a weekly bookish meme hosted by MizB of Should Be Reading. Share the title and the author, too, so that other TT participants can add the book to their TBR lists if they like your teasers. *I'm almost done this novel and I must admit that I am enjoying it as much as Hush, Hush. I'm hooked! Crescendo took a turn in a direction I didn't see coming. Plus, how fabulous is the cover? It's one of my favorite covers of the year. Wonderful teaser, Christina! 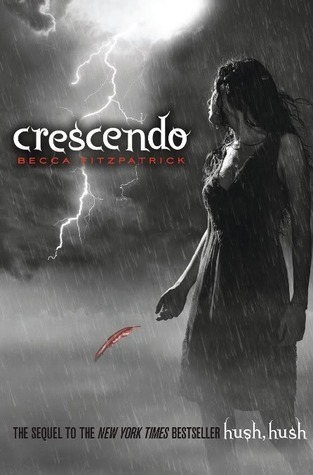 I'm looking forward to start my copy of Crescendo, I was also hooked on Hush, Hush. Wonderful teaser! Sounds like a good read. I like the teaser! I have the book on my TBR stack but haven't gotten to it yet. My teaser is from Beatiful Darkness by Kami Garcia and Margaret Stohl. Happy reading! I want to read this SO bad! I love that teaser and I'm so happy you're enjoying it as much as Hush, Hush. I'm curious to know what question he drove off from. Argh I am feeling angry right now! Stupid, driving away isn't the best solution, right? oooh, i remember this part!! i hope you like the book! Thanks for checking out my teaser, everyone! Hope you have a great week! The covers are amazing for this series and FAB teaser!